I founded Wearable Collections clothing recycling in NYC as a reaction to my best friend being paralyzed when he was hit by a car. My friends and I were constantly thinking of ways to raise funds and awareness for spinal cord research. My light bulb moment? Seeing a garbage bag of clothing left in the hallway of my NYC apartment building. My thought: a bin inside the building would provide convenient used clothing disposal for NYC residents while at the same time making for an efficient collection location. In addition, the clothing would be recycled and not thrown away. We could raise money for charity, and this would be the foundation of Wearable Collections ethos. This was 2004, pre-Inconvenient Truth, so we didn’t have the momentum of the sustainable movement at our backs. It was very grassroots, reaching out to friends to ask their building managers if we could place bins. Some people understood what we were doing and took to it, while others were very hard to sell on our idea. We didn’t waste much time trying to convince non-believers, but rather spent of our energy finding like-minded people who were into recycling in NYC. We were amazed by the amount of support we got. Imagine a group with no previous waste management experience asking residential management companies in NYC to place huge bins to collect clothes for recycling in their building. It was a hurdle to overcome at the beginning but it’s a testament to our cause and prescient building managers who were eager to divert a portion of their trash that was directed for landfills. Textiles make up around 5% of NYC’s municipal waste stream. New Yorkers were becoming aware of our over-consumptive habits and the damage that it was causing to the environment. As consciousness was raised, so was the demand for our service. We added a “request a bin” form to our website and were inundated. I educated myself on waste management by reading tons of books on garbage, and throwing lots of ideas against the wall. It was really exciting to brainstorm ways of creating hubs of convenient clothing collections around New York City: residential buildings, schools, universities, community groups, and non-traditional places like the starting line at the ING NYC Marathon (Link here to watch a video of us in action) and NYC Greenmarkets. Each of these verticals brought their own challenges that invigorated us. 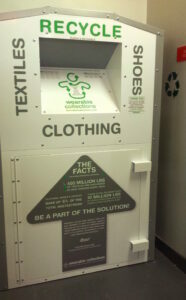 This past year, Wearable Collections marked 10 million pounds collected for clothing recycling in NYC. We are social entrepreneurs to the core and have stuck with our mission: to raise funds for organizations through the collection of clothing. Each year since our inception, we have generated more funds for our non-profit partners (charities and organizations) than we have profited, yet our for-profit status is still a point of contention to some who associate our little-engine-that-could small business to big-box-store corporations. In order to have long term success, we need to be sustainable both environmentally and economically. While diverting 10 million pounds of clothing, shoes, and textiles from landfills for recycling in NYC is an accomplishment in and of itself, we have proved that in-building collection works. 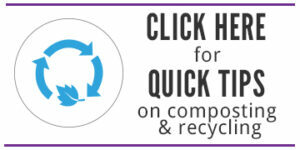 It is now possible to collect for recycling this way not only textiles but also electronic waste and organics. Starting in 2008 to collect clothes at two GrowNYC greenmarkets, our collections are currently 31 markets strong, representing over 3 million lbs. of clothing, shoes and textiles in this segment only. Our model of collecting clothing for recycling in NYC has caught the eye of municipalities around the country and can easily be replicated for other niche materials. With so many cities coming out with zero waste initiatives, textiles is now clearly on their radar screens. We plan on being part of the conversation until there is no more waste to speak of. Posting Guidelines – This and other stories published on WeHateToWaste.com are intended to prompt productive conversation about practical solutions for preventing waste. Opinions expressed are solely those of the contributors and WeHateToWaste implies no endorsement of the products or companies mentioned. Adam Baruchowitz is the founder of Wearable Collections, a company focused on diverting clothing, shoes, and textiles from landfills by creating convenient hubs of collection. Since its inception, Wearable Collections has collected over 10 million lbs while raising hundreds of thousands of dollars for charitable partners. I love thrift shops … so many great articles of clothing that are only gently used! I love to read stories like these about inspired individuals who decide to run with their “light bulb ideas”! Kudos to you Adam and your team for identifying a need and running with it. Such an inspiration. With only 1% of consumer goods still in circulation six months after purchase, it’s great to see a way to capture and divert some of this material waste! This seems like a great way to deal with zero waste initiatives and allow students to volunteer. I’m curious if thrift stores ever end up donating to you? That is where my old clothes typically end up but I wonder if they are inundated with clothes. Do you find that we have a fast enough turnover rate in the US or is the market for secondhand clothes here already saturated, thus a need to ship clothes to other countries? Also, H&M’s clothing recycling initiative is an interesting point for discussion. Their video promoting closing the loop in their brand has gone quite viral– https://www.youtube.com/watch?v=s4xnyr2mCuI. But is it greenwashing if they are still motivating consumers to purchase more and more “fast fashion”, as mentioned above. How much should we promote recycling and how much should we promote reuse? The author mentions that finding support for his efforts was much more difficult in 2004, when the company was initially founded, than it would have been today. I thought this was interesting, because 2004 does not seem very long ago, but sustainability consciousness has developed exponentially since then. It would be interesting to study this movement amongst consumers and its development within the 21st century to gain insights about how we can grow it in the future.